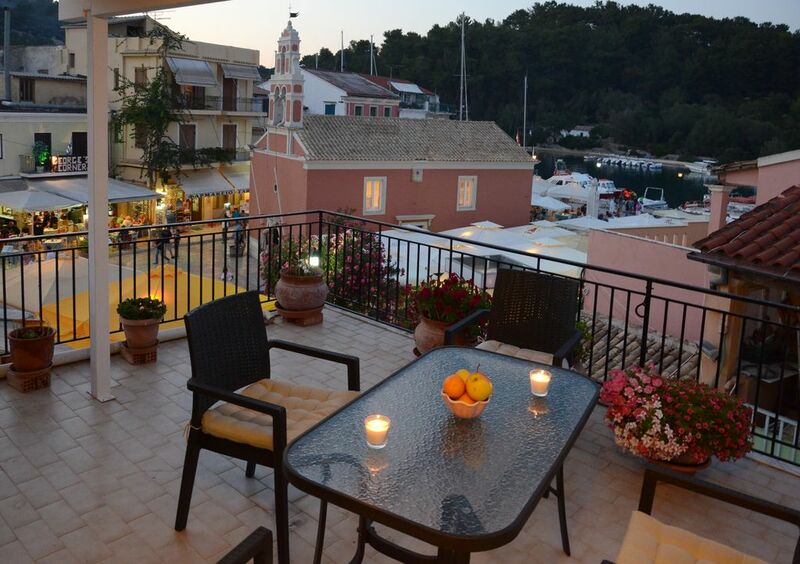 Our small apartment of 55 square metres stands on the second floor of a building in the main square of Gaios,the capital of Paxos. Is consisting of two bedrooms with double beds,fully equipped kitchen,bathroom and a spacious veranda with sea view. From our balcony can relax wathing the pine trees of the tiny island of Saint Nikolas,the luxurious yachts passing or parking in the island marina and the people walking in the main square and in the road on water front. Great apartment which was clean and comfortable, and perfectly located right in the centre of everything. So nice to sit quietly with a glass of wine on the patio at the end of the day, watching yachts mooring and the central plaza come back to life after the afternoon lull. Its central location made it ideal to meet up with my travelling companions and easy to getvsafely home at the end of the night. The only draw back is that, with the French doors open, it is very noisy (with restaurants and bars just below open until the early hours) but that was solved by closing the doors and using the air con at night. I hope to return to Paxos and will definitely try to stay here again! Thank you! We look forward seeing you back!!! Fantastic property with an extremely nice owner. Many Thanks Sotiris, see you soon . From the moment I arrived my stay at Sotirios apartment has been great. He collected me from the ferry and showed me how everything works. Everything is new and good quality. The apartment is close to restaurants and the supermarket is very close by. I enjoyed every minute of my stay and have the highest praise for Sotirios and his family. I would highly recommend staying here, I have no criticism at all. The whole apartment is lovely. Thank you Sotirios for your attention to detail and for making my stay here perfect. Thank you very much for being so nice to us. Appartamento meraviglioso in pieno centro pedonale nuovissimo comodissimo dotato di tutti i confort. Ottima pulizia giornaliera con cambio continuo di asciugamani e lenzuola....in 9 gg che io e la mia famiglia abbiamo soggiornato qui ....almeno 3 volte! Anche se non abbiamo avuto il piacere di conoscere il proprietario da vicino ci ha supportato per ogni cosa durante il nostro stupendo soggiorno a Paxos! Le petit appartement de Sotirios est très bien situé. Les restaurants et le vieux port sont au pied de l'appartement qui est cependant bien isolé phoniquement donc pas de soucis pour dormir. La climatisation est très appréciable. Le ménage est fait lors du séjour. La terrasse est très agréable. A noter qu'elle est orientée vers l'est : le soleils tape donc dès le matin et il fait chaud pour prendre le petit déjeuner en plein soleil. A noter aussi, qu'il n'y a pas de salon mais en été on vit dehors, ce n'est donc pas gênant. La décoration est simple et moderne. La salle d'eau est très jolie même si toute petite. Bref nous avons passé un excellent séjour. Sotirios a été très à l'écoute de nos questions et très réactif pour y répondre. Visit Panagia island and it's great Greek Orthodox Monaster. Visit also Antipaxos island and swim to it's carribean style beaches,try the local wine and taste fresh fish and lobsters in nearby fish tavernas.